I'd like to start by congratulating all of our Wrap Up the Season winners!! Dot Dollars expire today, Friday, January 10th. I highly recommend calling each of your December customers as a reminder! They should have received an email on January 3rd with their promotion codes, If not, you can view them in the Stylist Lounge and email them to your customers. It's definitely worth the hour or so it will take to contact everyone. I typically have $1000+ in sales from Dot Dollars orders. The amount of a trunk show without leaving the house! Has everyone checked out the new spring line? What are your favorites? I'm loving the Elodie and Crosby Link necklaces. I think the Devon layering necklaces, Somervell in silver, and amelie bracelets will be huge sellers. Sample ordering is open until Saturday, January 25th. There is no substitute for seeing the line in person, so I recommend you attend your local spring rally happening all over the country. If you're local to the Bay Area, there are two this weekend: one on Saturday the 11th from 9:00-1:30 at the Claremont hotel in Berkeley. Jessica Herrin is the special guest for that one. Let me know if you need the link to RSVP. I will be at Catharine Williams' rally in San Mateo on Sunday the 12th from 2:00-5:30. There are spring rallies listed in the Stylist Lounge. Let me know if you need help finding one near you! 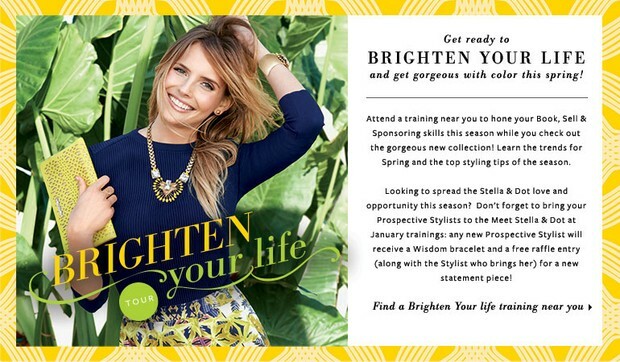 In addition to our gorgeous new spring collection, there are so many promotions going on! Jump Start for All was just announced!! I don't know about you, but I get super motivated by free product!! I am beyond thrilled for the opportunity to earn more! From now until March 9th, you will earn $100 in credit for selling $1000 by Feb 8th, and then you can earn UNLIMITED free product credit based on sales. You can also earn $100 for each Stylist you sponsor. For all of the details on the new Jump Start program, check the front page of the lounge. So what should you focus on after calling your Dot Dollars customers and registering for a spring rally? Book, book, book! Use the January Hostess Bonus special and new spring collection as tools to book. Enthusiasm speaks volumes! You are offering them a GIFT....adorable free accessories for a hour or two of shopping with friends. The first chance to view the new collection. Personal styling service for her and her friends in the comfort of her own home. As always, I'm here to help!! Contact me if you want opinions on the new line, help with booking, questions about anything, whatever you need. Here's to a BRIGHT 2014!